The subtitle “The Big Picture,” encompassing the fourth-floor section of the Museum of Modern Art’s spectacular new show “Abstract Expressionist New York,” is a play on words. Providing a wider context for the “New York School’s” triumphant breakthrough during the 1940s, including various media such as drawing, prints, and sculpture, as well as artists too often neglected, it also emphasizes the unprecedented large scale of some of the works. David Smith’s 1951 Australia is made of painted steel on a cinder block base. This is one of those landmark exhibitions only the Museum of Modern Art is capable of, using art solely from its own vast holdings in this area. It reminds us that Abstract Expressionism, also known as the New York School and by its subgenre of Gesture Painting or Action Painting, arose in reaction to the unprecedented horrors of World War II, with all the attending violence of the Holocaust and the atom bomb. Until about 1945, American art had taken a back seat to Paris as center of the art world, but the war forced artists and art dealers to flee Europe for New York City, and one of the biggest shifts in the balance of power in the history of art occurred. American artists, many inspired by Surrealism, became the acknowledged leaders of the international avant-garde. Daring, provocative, and disturbing at the start, today this art dazzles with the authority of work long considered iconic. Indeed, it comes across as Old Masterly. The show is far too vast and important to begin to comment on it as a whole, so I thought I would take the liberty of looking through a special lens. Of course I loved seeing the huge Jackson PollockOne: No. 31 (1950) beautifully exhibited so that you can observe it from a distance framed in the doorway. 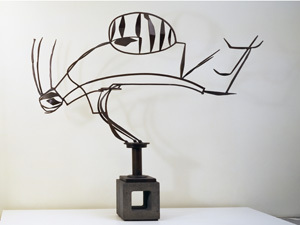 David Smith’s large sculpture Australia (1951) complements it nicely, seemingly drawn with steel in space. The beauty and power make you gasp with pleasure and awe. But the two things that affected me most in this show were the way the sculpture, drawings, prints, and even photography fit into the Abstract Expressionist context and the realization that I have had the good fortune to know a number of these artists personally. It was fabulous to see Richard Pousette-Dart’s enormous Fugue Number 2 (1943; pictured) alongside the Pollocks, Hofmanns, and Motherwells where it belongs. I knew Richard and played tennis with him when he was in his 70s. A vegetarian and profound pacifist, he nonetheless possessed a merciless backhand. As a young, deferential art historian, I tried to be courteous, but he quickly took advantage, and vanquished me. I see that power in the paintings, along with the deftness of hand. In the 1970s I visited and interviewed James Brooks about the mural he had painted for the WPA Federal Arts Project at LaGuardia Airport’s Marine Terminal (which had been covered over, and has since been restored). He’s a kind and somewhat self-effacing man, and his painting, Qualm (1954), quietly reflects his personality. I used to see Louise Nevelson walking around the Village with her mink eyelashes, her dramatic black outfits and overpowering silver jewelry. Unfortunately she became seriously ill, and had to cancel the interview I had set up with her about Nightsphere-Light (1969)—the large black sculpture she made for Juilliard, now reinstalled on the back wall of the Peter Jay Sharp Theater lobby. There are a lot of incredible Nevelsons in the show. Two women I did get to know were Lee Krasner, famous as the widow of Jackson Pollock, and Dorothy Dehner, divorced from the great David Smith, but still devoted to his memory. Lee had helped Jackson to achieve fame, to develop into the titan he became at no small personal cost. During his lifetime, she was sometimes known as “the wife who also painted.” After his fatal car crash in 1956, she painted far more prolifically, and with increasingly larger formats. Three of her paintings hang in the fourth-floor galleries: a small-medium Untitled (1949), a medium Number 3 (Untitled) (1951), and a large, 10½-foot-long oil, Gaea, (1966). They are varied, and reflect her intelligence and creativity. Do not miss the exquisite, agonizing pathos of the beautiful Arshile Gorky paintings, the sumptuousness of the deKoonings, the transcendent power of the Rothkos; the musical works of John Cage and Morton Feldman; and the photos of Aaron Siskind, Roy DeCarava, Robert Frank, Minor White, and others that focused on abstract shapes, lines, and textures paralleling the painted canvases. This is a great show, an iconic show; it is one that will be referred to continually in years to come. Make sure you see it. In fact, the vast exhibition calls for numerous visits. “Abstract Expressionist New York” runs through April 25, 2011, at the Museum of Modern Art, 11 West 53 Street, between Fifth and Sixth Avenues. For museum hours and more information, visit moma.org or call (212) 708-9400.